I like today for three reasons. One, it's Friday. Two, it's my birthday. Three, it's April Fool's Day. An unrelated note: while our neighbors were out of the country recently, we may have accidentally let ourselves into their house and applied self-adhesive googly eyes to their stuff. Some eyes might possibly have ended up in our house, too. Happy Birthday! I like the eyes, very cute idea. hi! i haven't commented on your blog before but i have to tell you that a) I LOVE IT, b) happy birthday! and c) i am dying over this googly eyes idea. you just prompted me to jump on amazon and buy a pack of googly eyes, i am totally doing this every time we visit friends' houses going forward. HILARIOUS!!! happy birthday! very funny about the eyes. will have to try that one. you can always lie about your age on your birthday and say that you're simply april fooling! have a great day, birthday girl! Love the googlie eyes. Will be adding that to my list o'pranks. Haha! That's a fun one. Happy birthday! Today is also my father in law's birthday. As the neighbor who came home to wiggly eyes after an international flight, I must say, I laughed out loud! It kept us in good spirits, thanks to you both! Don't worry, Mum. It worked out well because it helps people remember my birthday. Thanks for all the happy wishes, everyone! And if you have any good April Fool's pranks to share, YOU MUST TELL ME. I love practical jokes. happy birthday to us both! my bday too! i'm scheming about the googly eyes & who might be on my target list!! super fun...thx for sharing! That is great! What a cute idea. I bet if I did it to my girls stuff, they would love it. Thanks for Sharing and Happy Birthday! Hope your Birthday Day is really wonderful! Congrats - Hope you have a happy orange day! Happy Birthday! And I love the googly eyes thing. Subtle, harmless, but funny. happy birthday! It's a GREAT day for a birthday -- It's also my sister's and my daughter's birthdays today, too! PS: the eyes would freak me out. Happy birfday! And I think more things should have self adhesive googly eyes. Seriously. Happy Birthday! I love some googly eyes...they add fun anywhere. Happy Birthday! It's my birthday month too! Yay! Andddd April Fools is my fav! Jess, happy birthday! It's mine too so, it must be that only amazing people are born on this day. Definitely love this idea! I'm going to use it on my niece and nephew! Happy Happy Joy Joy! Eat some cake. I love the googly eyes idea! Happy birthday! I hope it's a fantastic one! That's frikken awesome- that 1, it's Friday; 2, you share your birthday with a holiday that doesn't deprive you of gifts (like being near Christmas); and 3, the googley eyes. Mental note posted for April Fool's 2012. Is it *really* your birthday??? happy birthday! i thought of this blog on ebay last night when i searched pantone and saw an orange pantone mug for sale!! No wonder I love your site so much...I am an April Fool's Baby also!!! Happy Birthday!!! Happy Birthday, Anyone who would sneak in to a neighbors house and add goggly eyes is someone I need in my life. happy birthday jess!!!! have a sweet, orange day!! ps: your mom is the sweetest.. Your neighbors will get quite a laugh when they get home! Happy birthday! Congratualions for the date and for beiyng such a good blogger! Happy Birthday Girly! Have an awesome friday, you are so lucky it lands on the weekend! Oh and sneaking over to your neighbour's house - so sweet! Love the googly eye trick...must remember that when next I babysit the neighbours house! p.s. orange is my favorite color. Happy Birthday! Googly eyes are the best! I'd die laughing if someone did that to my stuff. I'd probably just leave them on there forever so I culd laugh about it!! Happy Birthday! I hope you are having a lovely day. The goggly eyes seem like they would help move things in that direction. It's my birthday today too and I'm having a great day so far, despite the snow in Boston. I totally forgot it was April fool's!! Quick. I've got to think of something to do. Happy Birthday, Jess! Hope it's a great one. Love the googly eye idea and happy birthday!!!!! Happy Birthday! Too funny you remind me of a time when I was in high school my friend and I snuck in to the school after hours and glued hundreds of googly eyes to a teachers door. He would always say he was watching us in class so we left a sign that said we're watching you. Happy Birthday!! I love the "eyes"! The happiest of birthdays to you! Its my sweet dads birthday today too. Happy bday to you too. I love this eye thing. I'm going to do it to my co-workers stuff. I get in way earlier than them and I can't wait for them to show up and see pairs of eyes staring at them all day. LOL!!!! I'm so reusing the googly eye idea! It's hilarious. Now I just need to discretely beg for keys . . .
Wishing you many, many happy returns, and thank you so much for your wonderful blog, which is one of my favuorites. A very happy birthday to you. Isn't anybody else worried that you are using hair gel to brush your teeth? 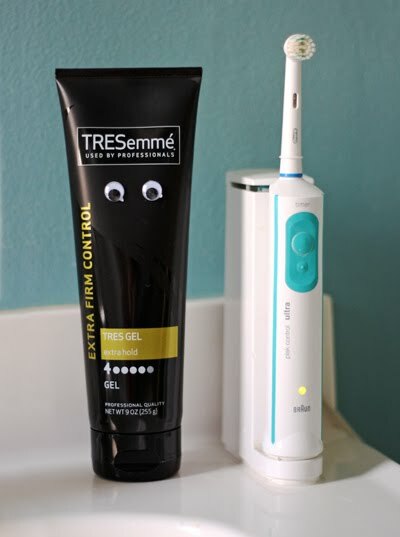 Are your teeth so loose that you require extra firm control on your toothbrush? Or are you applying gel to your hair with the pulsating oral B brush? Here's hoping those problem teeth or unique hairdo did not hamper an awesome April Fool's birthday! Hey! It was my birthday yesterday, too! April Fools Babies. :) Hope you had a great day! A very happy birthday to you, Orange Lady. I'm always late - Happy Birthday Jess. Hope you are having a great weekend! SNAP....from one April fool birthday girl to another Happy Birthday :) Barb. Happy Birthday! Friday was my birthday too! Happy Birthday! It was also my son's birthday, as well (his first).